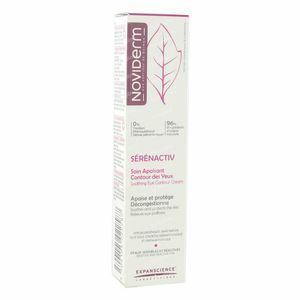 Noviderm Serenactiv Soothing Eye Contour Cream 15 ml order online. Moisturises the skin thanks to glycerine and emollient active ingredients. Instantly decongests thanks to the action of dextran sulphate. Instantly and long-lastingly relieves feelings of discomfort (tightness, stringing, irritation) and the visible signs of sensitive skin thanks to the action of the cyclo-ceramide and lupin pentapeptides combined with quinoa peptides. Protects from harmful external factors (in particular, pollution) thanks to vitamin E acetate, well-known for its anti-free radical activity. Preserves the integrity of the skin thanks to sunflower oleodistillate, rich in essential fatty acids and quinoa peptides that help to rebuild the cutaneous barrier. Eye contour skin is immediately moisturised, soothed and protected. Your eyes look refreshed and puffiness is reduced. Apply morning and evening, lightly dabbing onto the eye contour. Lightweight and highly moisturising, Sérénactiv Soothing Eye Contour Cream melts into your skin and brings your eye contour an instantly soothing and relaxing feeling. Fragrance-free, it respects the sensitivity of even the most sensitive skin. 96% of natural origin ingredients: Water Glycerine: moisturising, moistening. Propanediol Dicaprylate: emollient. Dicaprylyl Carbonate: emollient with a dry silky finish and is quick to spread. Glyceryl Stearate Citrate: emulsifier. Cetyl Alcohol: waxy fatty substances, consistency factor. Helianthus Annuus Seed Oil Unsaponifiables (Sunflower oleodistillate): concentrate of sunflower oil which has restructuring properties by stimulating the synthesis of epidermal lipids. Glyceryl Caprylate: plant origin emollient ester with an anti-microbial activity. Dextran Sulphate Sodium: softening, anti-oedematous activity. Sodium Stearoyl Glutamate: mild emulsifier Hydrolysed Lupin Protein (lupin peptides): soothing and anti-irritant active ingredient. Xanthan Gum: thickener obtained by biotechnology. Hydrolysed Chenopodium Quinoa Seed, Maltodextrin (quinoa peptides): strengthen cellular integrity of the cutaneous barrier, help maintain a good level of hydration and have a soothing effect 4% of synthetic ingredients (introduced in the right amounts to ensure the effectiveness of the product and enhance your pleasure of use): 1,2-Hexanediol: moisturising, moistening. Acrylates/C10-30 Alkyl Acrylate Crosspolymer: gelling agent. Tocopheryl Acetate: Vitamin E acetate, anti-free radical. Prevents changes in the skin induced by UV. Undecyl Dimethyl Oxazoline (cyclo-ceramide): active ingredient with soothing and anti-irritant properties. Sodium Hydroxide: pH regulator.